Acrylic tubes have many different purposes. Using these for DIY projects like kalkwasser drippers, feeding tubes and they even can be used to help add support small aquascapes, it is always a good idea to have extra acrylic tubing on hand. 16" of clear acrylic tube with 1/4" diameter. Perfect for making your own Kalk dripper. 16" of clear acrylic tube with 1/4" outside diameter. Perfect for making your own Kalk dripper or other 2 part reservoirs. These tubes will accept 1/4" push connect fittings. To cut the tube we recommend using a new razor blade and score the outside of the tube where you want the cut to be. The scoring mark should be about half of the overall thickness of the tube. After scoring completely the tube should snap easily with a clean break. A little sandpaper can clean up any sharp edges or defects in the break. If used for aquascaping we recommend using short sections to help stabilize the structure. You can use a small drill bit to recess the tube and then either secure both rocks together with either epoxy or super glue. 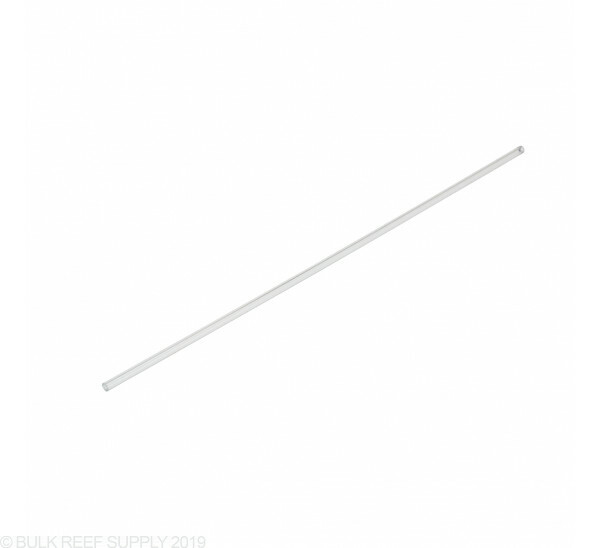 We suggest using this rod to help secure your already semi-stable aquascape. Large sections of acrylic tube under the weight of the rock can may cause the tube to bend or break. Easy to work with. I use a dremel to make quick cuts instead of the score and snap method. I use these in my 2-part containers for dosing - they don't curl like flexible line. No problems! It is what it is, acrylic tubing. Score it where you want your cut with a razor blade and break it with even pressure. Works like a charm, and seals up great with the murlok fittings. Used this to drop kalkwasser on coral. Worked great. I used the tubing to acuascape small rocks. It is holding up very well. They are easily trimmed with a small saw. Useful for all sorts of functions from holding an airstone at the bottom of a bucket or using as a probe to flip snails over that fall to the sand bed. Hope this helps for everybody who had problems. Good luck! Doesn't fit into/outside of standard airline tubing - had to use some heat-shrink tube to get it to attach for my application. A little disappointed there, but I can't find this stuff anywhere else either. Great to use for a DIY dosing container / ATO. I have also used these combined with a Mur-lok 90deg Push Connect and airline tubing to create a mini siphon for daily cleaning of a fish QT tank for fish waste and debris off a bare bottom tank without removing much water. Thank you BRS! It seems like most people have had good luck with this, but I did not. I tried using this with the 1/4" RO bulkhead fitting sold here at BRS, the BRS Top Off Doser (50 mL per minute) and a 5 gallon bucket (in the tank stand) controlled by a Reefkeeper controller. I installed the bulkhead in the lid with the rod inside the bucket in the hopes of being able to set a draw level that was near, but not right at the bottom of the bucket. I could not get this setup to maintain a prime and keep working. I had to change out this rod to a regular piece of 1/4" poly RO tubing and it's now working fine. I tried two difference pieces of acrylic tubing (tried multiple cuts to make sure it was a clean/flat cut that would seal well in the bulkhead) and two different bulkheads...no luck. It may just be a limitation of the pump since the ID of the rod is significantly smaller than regular 1/4" RO tubing...perhaps the pump can't generate enough suction to draw reliably through the small diameter...or possible I just wasn't getting a good enough seal with the rod in the bulkhead...or maybe a combination of the two. Are you able to purchase this in a longer length by any chance. Seeking a piece that is 30" long. Unfortunately, we do not sell this item in a longer length. I have heard that you may be able to find such a length in big box hardware stores. Have a great day! Is the 1/4" the interior or exterior measurement? (I assume interior but you know what happens when you assume.) 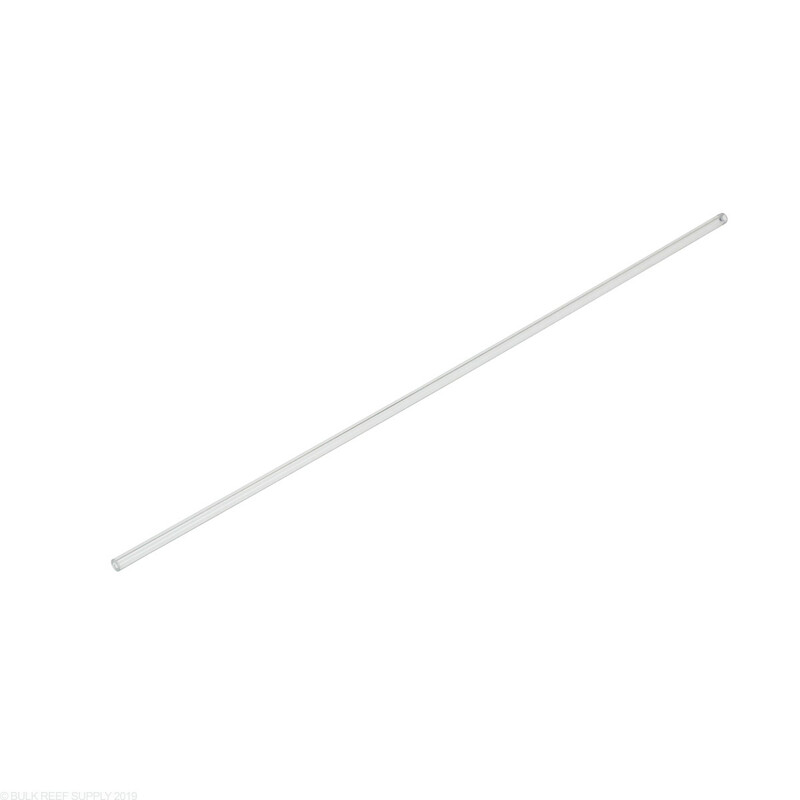 Specifically, will a quarter inch dowel fit through it? The 1/4" on this is actually the outside diameter and the inside diameter will be 3/16". The dowel rod will not fit in the tube. Feel free to let us know if you have any further questions. Do these tubes fit inside of a standard 1/4" John Guest Fitting. I want to use it as a pick-up tube in a ATO container I built. The acrylic tubes will work perfect with the 1/4" john guest fittings! Feel free to let us know if you have any further questions! Will this fit the BRS 1.1ml dosers? 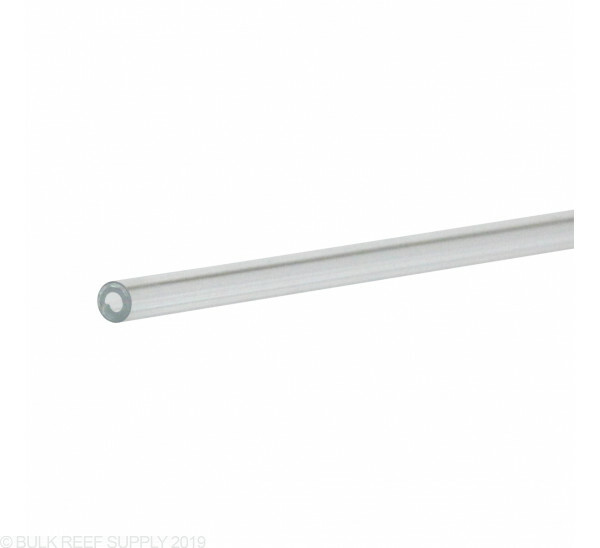 The Acrylic rod itself is rigid and cannot be connected directly to the dosing pumps, but it is compatible if connected via soft airline tubing. 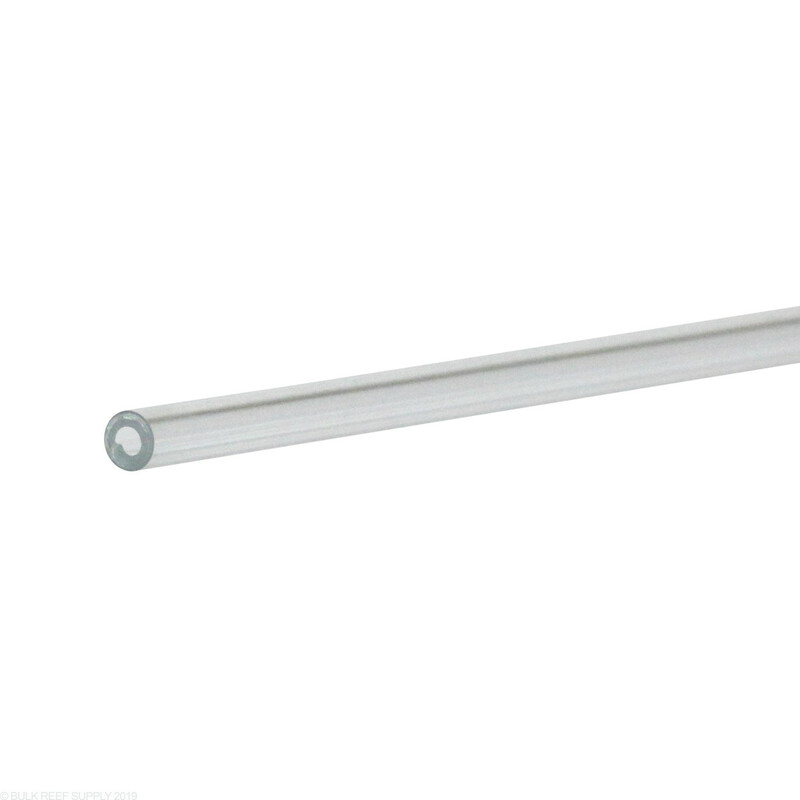 We typically use this rod in conjunction with 3/16" ID/ 1/4"OD airline tubing and a 1/4" mur-lok bulkhead, since this will connect to any tubing with a 1/4" OD. If I need 32 foot of this will it come as a 32 foot roll or in sections? This is hard rigid tube that is sold as 16" pieces (it doesn't roll up). If you ordered 32 for example, you would get 32x 16" pieces. Our flexible tubing is sold by the foot though, so if you ordered something like 32ft of our 1/4" RO tubing, that would come as a single rolled up 32ft piece.